Yeah. I’m offski. And I can’t tell if I’m sad to be going or not. Technically, of course, I left once before, and I couldn’t bring myself to blog about that either – the best the Internet got was a post about how I’d made it back to Newport – but at that point I was still hoping I’d be coming back again once Ruth finished her Industry Year, and I wanted to keep quiet so as not to jinx things. This time, though, I’m not returning. Yeah, I might come back for a few days here and there, but I’ve come to realise that I can’t live here anymore: it’s simply time to be going. There are no jobs here, and Ruth is away in Oxford, and by the time you account for the people leaving in the next four months or so just about every friend I have in town will be gone anyway. Most of them, in fact, have already gone: of the people I was in Penbryn with, nothing beside remains. I feel like George, in the final episode of Blackadder Goes Forth, and in itself I think that’s a good reason for me to be getting out. I feel like I’ve gone off Aber lately, and I blame having too much to do. This is an absolutely fantastic town to live in, but if your definition of ‘living’ has been reduced to ‘fit in as much work as you can and see if you can free up an hour or two for sleeping’ then wherever you live will have the magic knocked out of it. This town used to feel like home, and lately all I’ve been doing is counting down the days until I can get out of it, and won’t have to do so bloody much all at once anymore. The past year has burned me out like never before and I’ve just not had time to appreciate the place – it’s the same feeling as when you get to the end of the day, and no matter how interesting the radio show, all you want to do is get some sleep. Indeed, I’ve had that feeling quite a lot lately, mainly around 04:00 when I’ve tended to realise I’ve not been to bed for yet another night on the trot. If this is the end of the day, then, it’s been a damn long and busy one. It’s been productive, though. In my time I’ve seen what lies beyond the secret door in the balcony of the Old College Library, explored the attics of the Queen’s Hotel and been inside the excuse for a Civil Defence bunker beneath it. I’ve eaten in Branwens and survived it, and in Ta Med Da and seen no difference. I’ve seen Alexandra Hall rebuilt, the derelict platform reconstructed, and found all three of the University computer rooms in town. I remember when there was a Dixons, and there were Pink Floyd covers painted on the wall of the Fountain, and the shop run by Cyril the World’s Most Disreputable Locksmith was still doing a brisk trade in, er, keys. I’ve watched as Galloways went down, and Harry’s turned from an expensive swanky restaurant to an expensive manky themebar and I’ve ridden the mythical Disco Cab with all the interior lights flashing. I can remember the awesomeness of Stu, a man who used run Aberystwyth’s only 24 hour taxi service on his own, and I barely have the digits to count the number of times he came through for me at four in the morning. He got burnout too, small wonder, and yet once last year we were sat in the back of a taxi out to Morrisons and reminiscing about the days of Stu, and how we’d missed him after he went, only for the driver to turn round and say ‘It’s nice there’s still people who remember me,’ in a final glorious swansong. Even though I’ve had seven years, I’ve managed to do an awful lot in my time. Back in the first year I even had time to do some acting with the Nomads, and delighted old James Ellington by singing Bravely Bold Sir Robin whilst being sick into a bucket (his fault for giving me whisky on top of wine. And wine on top of cider…) And then when I was too busy for AmDram, I taught myself to stay awake all night, to live on coffee, and to map my network drive from a Citrix box so I could sit in the dark and play Uplink in the quiet hours. I’ve spent far more hours than is healthy cramped up in tiny rooms with a stream of nervous Freshers with their faces blurred into a succession of panicking expressions without a name, and I’ve spent a summer alternately commuting to pack chocolate in Tywyn and shouting down the Guild until they crawled away spattered with the gore of their own failed machinations and embarrassment. I genuinely believe I managed to do some good, somewhere along the way, and by my standards that ain’t a small concession. I’ve certainly known good people, and I can’t help but hope that some of their attitude to life has rubbed off on me. I suspect that’s why I’ve finally managed to loosen up a bit, and to have more time for people (or at least those people willing to toe the line), and I no longer lock myself away behind austerity the way I used to: I’ve gone through more’n half this year wearing jeans, for goodness’ sake. 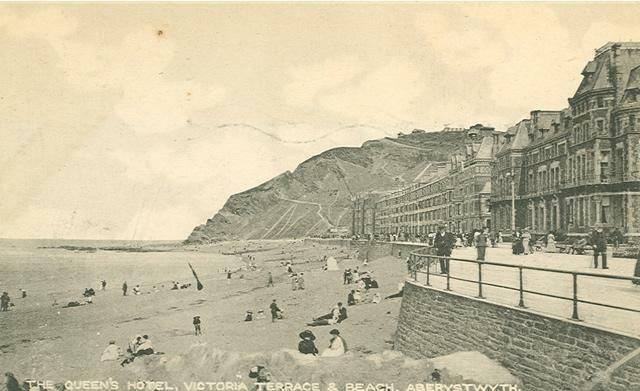 You didn’t ought to come out of University anything like the same person you went in as, or you can’t claim to have been properly drawn out at all, but it seems a shame that I’ve been changed into someone for whom a lot of the magic of Aber has gone. All that stuff I’ve done, and yet it feels like I did it somewhere else, somewhere less cold and less grey and somewhere… somewhere easier. I think that’s the real problem, it feels like the Aber I was in love with ain’t the one that’s here now, and in a lot of ways that makes sense. Aberystwyth is a beautiful place to be a student because it’s friendly and safe and secluded, and it gives you time to come out of school, and work out who you are, and who you want to be, and it lets you find the path between the two in your own time. Once you’ve done that, I don’t think it’s such an easy place to stay. Sure, you can hang on, but it’s like being in the wrong gear, somehow, and you can tell you’ve overstayed and you’re cluttering up the place, and you’re left watching as all the old ways die out, and new ways get invented and you can’t help but wonder what the old guard would’ve made of ’em, and that just makes you feel lonely. What I’ve got out of Aber is as much as anyone can hope to get out of a University: experiences. Some of ’em bad, most of ’em good, and all of ’em a chance to learn a bit more about myself and other people. If I’ve got some actual booklearning accidentally tucked away in there, so much the better, but it’s an incidental bonus to the value I already extracted. I’ve still got a stack of packing to do, and I’m looking forward to reaching Earth, and I will be glad to be gone, because if nothing else I need to give my brain a rest from all the constant juggling of roles it has to keep up in Aber. But I’ll come to miss the place all the same. I can’t be sorry yet that I’m going, because I really have been here too long, and it’s well past the time I can appreciate the place. I think I’ve done good work here, though I’m too exhausted to carry on with it and it’s time I let both of us get a decent night’s sleep. But, in the same way as I know it’s time to be going, I also know that by the morning I’ll be missing it again. And that’s all the more reason to start making a move. The Sunset over Castle Point May 29th, 2005. Well, there goes Masters Part One. Everything handed in and sorted out (assuming they don’t throw out my Diss proposal and make me do another one, anyway, which seems at least a bit unlikely). It took No End of all nighters (Normally, I shut my tower down at night to save on electric. Before the electric meter ran back out yesteraday it had an uptime of 4 days, 19 hours, 26 minutes, which was only 8 hours longer than I’d spent awake in the same few days. Now that everything is in, I’ve acquired a massive headache, which has presumably been lurking about to pounce on me, so I’ll guess I’ll stop gawking at the monitor for once. Who thought that all wars should be stoptet. But then he was dead and forgot-tet. Here is found the blog post which announced this year’s contest, in which entries have to be styled after a short story for children, max. 400 words. Untitled story about polar bears, by Mike Ferguson. “The Gashlycrumb Terrors,” by Laura. Untitled Little Red Riding Hood parody, by Isti. “The Boy who Didn’t Cry Wolf,” by yt. Untitled story about exploding imps, by Mister JTA. You can vote for the winners – by leaving a comment to state which number you preffer – at this page. So, y’know, please do. *It could’ve been a lot better: apart from anything else, it really suffered from the word limit (have you any idea how often a story designed to be told to children repeats itself as part of the natural form? I cut about five instances of “down the long years” so “back up the long years” loses a lot of it’s impact). I might return a full version of it once the voting is over, because I much preffered the 868-word version before I had to cut it down! So, yeah, the results are in, apparently. Can’t say it went quite as well as I hoped, but it went as well as I expected (this, as I explained to my sister yesterday, is pretty much the way it goes as a Lib Dem), and at least Cameron didn’t slide in on the wave of smug and hairgrease that his sense of entitlement autogenerates. From the Beeb results I suspect the Tories would struggle to get a meaningful majority from any of the ‘Other’ block, so it’s Lib Dems or bust. So, y’know, what happens now? A short-lived coalition of everyone but the Tories. One emergency budget, and an amazingly short Queen’s Speech which promises to push through electoral reform and then call a General Election under the new system. They don’t actually need to do anything else (and it’d be disasterous to try) but on those two points you could safely get enough support from the rest of the Others to carry things through (PR is in their interests too, of course, the only people to ever do consistently well out of it are – shocker – the Tories. Under a Government based on that that, presumably, the Conservatives would have a massive sulk because they feel like they won, but they didn’t win, they just got more seats than anyone else which isn’t how winning works under First Past the Post. (Incidentally, Tories, you should stop trying to have it both ways. ‘s bloody undignified). I think they’d be able to get Plaid and the SNP on board for that (and they could certainly get the SNP if they say they’ll hold an initial referrendum on devolution once PR is in – if’n they say that publicly the SNP can’t turn it down, after all) and everyone else should get a chance to return a new Parliament in the Spring. The Tories, under those circumstances, wouldn’t be in a position to hold things up too much because they’d be keeping themselves out of power if they did so (and, if they’re seen to be staving off the chance to re-elect a comprehensive majority, damaging their own national standing). …I think it could work. At least, it’ll work a damn sight better than a formal Lib-Dem / Con coalition, which is just a death sentence – Cameron, in that position, can carefully give Clegg & Cable lovely poison chalice jobs (‘Industrial harmony? You know what that means? That means strikes!’) and make sure to drag the Lib Dems down along with, er, everyone else. God’s teeth it’s come to something when the best you can hope for is a hung parliament, innit? Best spoilt ballot I’ve heard of this year goes to the daughter of Ruth’s boss, who took a pink pen into the polling booth in order to spoil her ballot with the line ‘My great-great grandmothers didn’t throw themselves under horses so I could be disenfranchised by your broken system’. Given that it was the first time she’d ever been eligible to vote, I think that’s pretty damn epic. Anyway. That’s my Ideal Scenario at this point, I think: Lib-Lab-Oth pact to push through PR in some form (I’d preffer STV, myself, but Hell even AV plain would be a step up on this farce), then take us back to the polls in the Spring. It’s rare to see a party trade political power for the national interest, but it’s lovely when they do (The last time I’m aware of was Lloyd George’s 3 General Elections in 1911 which helped to curb the Lords’ veto and get us pensions, so there we go). Anyway, Mark Williams is back in for Ceredigion, having garnered a whacking great 50% of the vote (almost an actual majority, who’d’ve thought we’d see that!?) and shot up from majority 219 to 8,000-odd, which is spectacular. Apart from the fact I’m usefully relaying election results to people far removed from civilization (viz: one friend backpacking in Australia, and one in Edgbaston), I think I’m getting tired. Because on the one hand, I’m making massive typos, and on the other, the results for Hammersmith just came in and I swear I sat here thinking ‘”Hammersmith”? Why does “Hammersmith” sound familiar?’ The answer, as I realised after they’d finished reading the results, is that I was there this morning yesterday. On the other hand, I have been up since 06:16 on Thursday, and I’ve dodged into London then hammered back out of it to vote back in Wales, and I haven’t actually slept. I’ve not spent the whole night awake since I used to sit up in Penbryn of an evening.